Everyone loses their temper from time to time. Anger is inevitable. We get angry when somebody doesn't agree with us or when misunderstandings happen. We also often end up in a bad mood when we feel irked by the inconveniences that happen in our everyday life. It is not easy to deal with people who are angry. The one who is angry suffers themselves and affects the people around them as well. They affect your mood negatively and hurt your feelings. In such situations, you need to be the better person and act sensibly. The following list will help you to act rationally in situations when you have to deal with an angry person around you. 1. Don’t aggravate the situation. 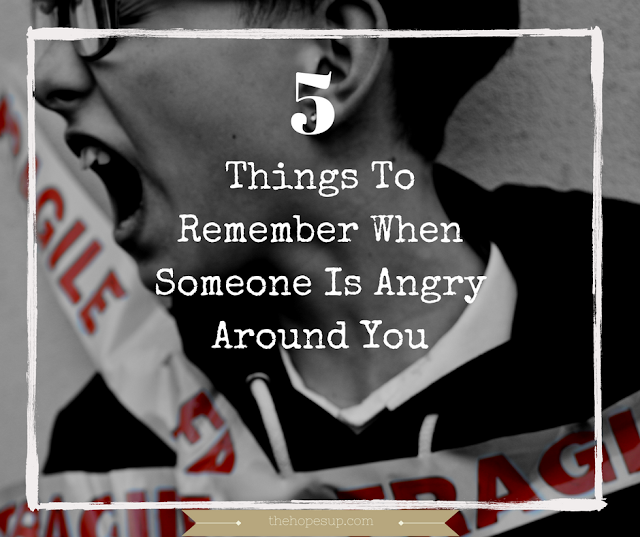 When someone near you gets upset and acts irrationally, you get negatively affected as well. Do not react. And do not lose your patience. Getting irritated and reacting aggressively only makes the situation worse. It can be avoided. It is understandable that you would be very uncomfortable in such a situation. However, you need to keep your calm and act responsibly even if the person around you isn’t acting the right way. 2. Don’t be scared of their behavior. When people are angry, they tend to act in a very aggressive manner and often don’t know what they are doing in that state. Different people have different ways of reacting when they are angry. Some people lash out violently, shout and throw tantrums, and some resort to crying or some people may stop talking to people around them. People are not themselves when they are angry. They tend to say things they don’t actually mean. They tend to do things that are highly unlikely and unexpected of them. Don’t be afraid of them. Remember that they are the people you know and interact with every day. They could be your friends, your parents, your co-workers or loved ones. It can be really scary to witness that version of them. Try your best to hold yourself together and keep your composure in front of them. 3. Remind yourself that they have a good side to them as well. When you see the mean, angry and disturbed version of someone, it can take a bit of time for you to see things normally again. In such moments, you have to remind yourself that they aren’t always this mean and irritable. Understand that they will eventually come out of this angry and mean space and return to their normal, amiable state. Sometimes it’s best to not say anything to the angry person because even the kindest words may not make any impact on their mood. They need a time out. Give them time to work through their feelings and get some perspective. As I mentioned above, people are not actually themselves when they are angry. Most of the things you say to them will not make any difference in their mood. In fact, they may end up misinterpreting your words and get even angrier. Allow them to cool down before talking to them or confronting them. 5. Acknowledge that you can’t make them think like you. You don’t have control over anyone else except yourself. The reaction you have to a particular situation might be completely opposite to that of another person. When someone is angry around you, you may not like the way they manage that situation. Everybody has a specific way of reacting to unpleasant situations, and some people end up being more aggressive than others. That is their way of coping with disappointments, frustration, misunderstandings, etc. There could be a lot of things going in their minds that you won't be able to figure out accurately. Despite all of it, you have to support the people you care about and be there for them. Usually, after calming down, most people feel guilty for their behavior, and that is the time when they will need you the most. You will have to support them so that they can forgive themselves and it becomes easier for them to recover and get back to their normal state. How do you deal with the people around you when they are angry? What goes on your mind when you are faced with such situations? Share with me in the comments below. I would love to hear your views on this topic. I'm glad you found it helpful. Thank you Kathryn! When someone is annoyed i tended to stay back and lay low to avoid over-reacting. I agree, over reacting in front of an angry person is only going to make things worse. Thank you for stopping by .